The views at the Silicon Valley Capital Club are unparalleled, providing diners with a bird’s eye view of downtown San Jose, and vistas looking North toward the San Francisco Bay that are simply stunning. 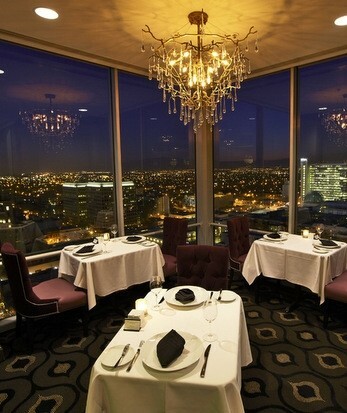 The Founders’ Room not only has breathtaking views, but also amazing cuisine to match! 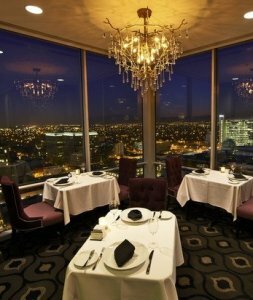 This exclusive restaurant is on the 17th floor of the tallest building in downtown San Jose and also has a superb chef in the kitchen. The Silicon Valley Capital Club is a members only club, but those who belong to SignatureWines.com community can enjoy access to The Founders’ Room, the club’s newly renovated formal dining room with plush seating, chandeliers, and floor to ceiling windows to enjoy those magnificent views. Executive Chef Ronald Garrido has crafted a robust yet elegant menu with creative flourishes that set each dish apart with a focus on the finest local, seasonal ingredients. Chef Garrido is one of Silicon Valley’s most distinguished chefs. Before moving to the Bay Area, Chef Garrido owned a highly renowned restaurant in Eureka called Avalon. Garrido elevates his cuisine with unexpected and delicious elements on every plate. Bold American cuisine meshed with classical French style cooking makes for a delectable meal. The Founder’s Room at the Silicon Valley Capital Club is available weekdays for lunch, ideal for entertaining business clients. Dinner is served Wednesday through Saturday evenings and provides the perfect backdrop for a special evening out. The Founder’s Room is at the Silicon Valley Capital Club, 50 W. San Fernando St (17th Floor of the Knight Ridder Building), San Jose. Reservations are required. Dress Code enforced: jeans, denim, hats, T-shirts and flip-flops are never permitted in the Founder's Room. For questions on additional dress code requirements and to make reservations call 408-971-9300. This is a SignatureWines.com secret. As a Signaturewines.com community member you can make a reservation here without the requirement of being a club member. SignatureWines.com VIP card holders enjoy free corkage once a month. Few places offer such great dining experience. I find it difficult to put to words the happy feeling and memories that this restaurant brings to my thoughts as I remember my meals here. All I can say is book a reservation for yourself, you will be delighted that you did. Superb in every way. Glorious view with an outstanding, delicious luncheon. Everything about our Saturday night dinner was spectacular. The service was splendid. The view as the moon rose was delightful. The food was memorable -- scallops as a starter, prawns with risotto and grilled salmon as entries were unbeatable. Souffles were good, though without a strong chocolate flavor. Worth the drive from the East Bay to repeat the experience, worthy of special occasions.